Center for Development and Strategy | Can scientists learn to make ‘nature forecasts’ just as we forecast the weather? 01 Feb Can scientists learn to make ‘nature forecasts’ just as we forecast the weather? Can scientists learn to make ‘nature forecasts’ just as we forecast the weather? 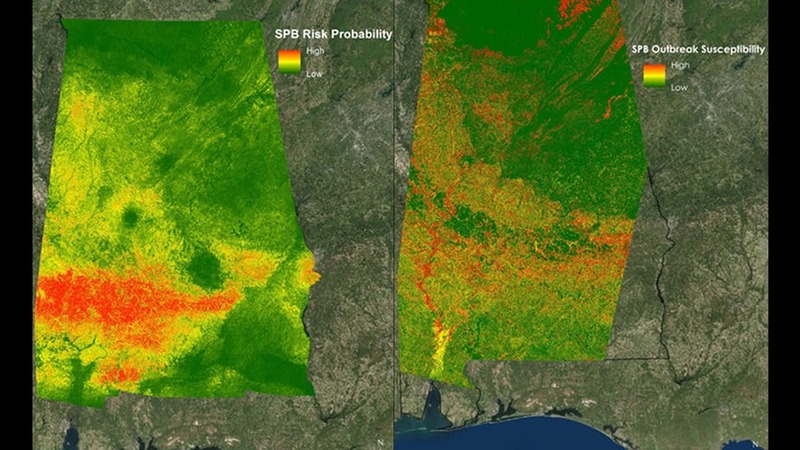 Images created by NASA with satellite data helped the U.S. Department of Agriculture analyze outbreak patterns for southern pine beetles in Alabama, in spring 2016. Imagine that spring has finally arrived and you’re planning your weekend. The weather forecast looks great. You could go to the beach – but what if it’s closed because of an algal bloom? Maybe you could go for a hike – will the leaves be out yet? What might be in flower? Will the migratory birds be back? Oh, and you heard last year was bad for ticks – will this spring be better or worse? We all take weather forecasts for granted, so why isn’t there a ‘nature forecast’ to answer these questions? Enter the new scientific field of ecological forecasting. Ecologists have long sought to understand the natural world, but only recently have they begun to think systematically about forecasting. Much of the current research in ecological forecasting is focused on long-term projections. It considers questions that play out over decades to centuries, such as how species may shift their ranges in response to climate change, or whether forests will continue to take up carbon dioxide from the atmosphere. However, in a new article that I co-authored with 18 other scientists from universities, private research institutes and the U.S. Geological Survey, we argue that focusing on near-term forecasts over spans of days, seasons and years will help us better understand, manage and conserve ecosystems. Developing this ability would be a win-win for both science and society. A ‘red tide’ bloom of Karenia brevis, a toxic microorganism that can cause fish kills and poison humans who eat contaminated shellfish. Scientists use satellite imagery and water sampling to predict harmful algal blooms and other short-term ecological phenomena. Beyond helping people plan their weekends, ecological forecasts will improve decision-making in agriculture, forestry, fisheries and other industries. They will help private landowners, local governments and state and federal agencies better manage and conserve our land, water and coastlines, for example by warning of events such as pest outbreaks and harmful algal blooms. They will improve public health through better forecasts of infectious disease outbreaks and better planning in anticipation of famine, wildfire and other natural disasters. Ecological forecasts will also deepen our understanding of the world around us, and of how human activities are altering it. Forecasting formalizes the cycle between prediction and testing that is at the heart of the scientific method, and repeats it on a much quicker cycle. It can accelerate the pace of discovery in the environmental sciences at this critical time of rapid environmental change. Weather forecast skill at the National Oceanic and Atmospheric Administration has improved continually and dramatically since the dawn of numerical weather prediction in the 1950s (100 = perfect score, 0 = random). 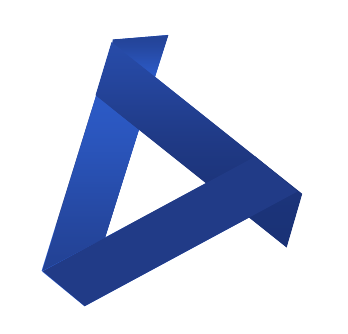 The increasing accuracy over time has been attributed to more data, faster computers and better tools for bringing data into models every day. The synergy of these factors has steadily advanced our understanding of the atmosphere and improved weather models. Big data is driving many of the advances in ecological forecasting. Today ecologists have orders of magnitude more data compared to just a decade ago, thanks to sustained public funding for basic science and environmental monitoring. This investment has given us better sensors, satellites and organizations such as the National Ecological Observatory Network, which collects high-quality data from 81 field sites across the United States and Puerto Rico. At the same time, cultural shifts across funding agencies, research networks and journals have made that data more open and available. Digital technologies make it possible to access this information more quickly than in the past. Field notebooks have given way to tablets and cell networks that can stream new data into supercomputers in real time. Computing advances allow us to build better models and use more sophisticated statistical methods to produce forecasts. So far, though, ecological forecasting has not kept pace with advances in data and technology. In our article, we lay out a road map for accelerating the field by tackling the bottlenecks slowing us down. Some of these bottlenecks are technical, such as better integrating the streams of data that are now available from many different sources, such as field studies, sensor networks and satellite observations. Other challenges involve human choices. Ecologists need to spend more time engaged in two-way communication with stakeholders, rather than just pushing out the latest research to decision-makers. And we need better ways to transfer state-of-the-art research from universities to agencies and private industry. Perhaps most limiting is that ecologists traditionally have not been taught forecasting concepts and methods. But as I have written, this situation is changing. There now are summer workshops and a growing number of university courses in ecological forecasting. Prediction is leading to new theories that aim to unify different parts of ecology. With data from the National Ecological Observatory Network (NEON), scientists can compare the health of U.S. ecosystems over time. At the dawn of numerical weather prediction in the 1950s, scientists at the National Weather Service faced a choice. They could either wait to start forecasting until the underlying research, models and tools improved, or proceed immediately with making forecasts and learn by doing. They chose the second path. It proved harder than expected – but had they waited, they likely would have failed because they would have missed a critical window when experts and agencies were willing to make major investments in this effort. Up to now, ecologists have generally adhered to the first, more conservative path. But in this time of rapid environmental change, the societal need and technological capacity for forecasting have never been greater. The forecasts won’t always be right, especially as the field develops, but failure is part of learning. The time for ecologists to start forecasting is now. The Center for Development and Strategy is a registered 501(c)(3) with the U.S. Internal Revenue Service.